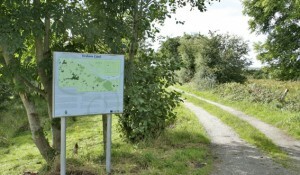 To make people aware of its heritage, Ballymagorry and District Development Association created a scenic walkway and successfully applied for a grant from the Rural Development Council towards erecting interpretative panels at two historic sites in the neighbourhood of the village of Ballymagorry. The Ulster Historical Foundation was given the task of researching, writing and designing the interpretative panels and a leaflet explaining to locals and visitors alike something of the history of the area. The leaflet also incorporated a map showing the scenic walkway and highlighting places of interest along its route. The interpretative panels dealt with respectively Old Leckpatrick Graveyard, the oldest burial ground in the locality, and Strabane Canal, once an important communication link and provider of employment in the area. The project was launched on 2 September 2005 and has generated much interest.